Greasewood is also known as black greasewood or chicowood. Sacrobatus is from the Greek sarco meaning "flesh" and batos meaning "bramble or thorn," referring to the succulent leaves and spiny branches of the plant. The family name "Chenopodiaceae" translates to "goose foot," referring to some members of this family's leaf shape, which resembles the foot of a goose. Greasewood was first collected by John C. Fremont  a famous Civil War veteran, western explorer and one-time presidential candidate  and first named by John Torrey as Fremontia vermiculatus, until it was discovered that the genus Sarcobatus already existed. Greasewood grows throughout the West, north from California to Canada, east across the northern United States and southern Canada to the Dakotas, and south to Mexico. It grows at elevations from 2000 to 8500 feet. Large areas may be covered by greasewood. Greasewoods are thorny, many branched shrubs which grow three to seven feet tall. The bark is white or dull gray in color. Leaves are fleshy, almost succulent, and grow from _ inch 1 _ inches long. Male and female flowers are separate, but they occur on the same plant (moneciousmeaning "one home"). Rose-colored male flowers are arranged along a short, upright spike. The greenish female flowers are also arranged along a short spike, shorter than the male flowers, and have fewer flowers per spike and arise from the leaf axils. The male spikes tend to be terminal. The seeds are cup-shaped with a papery wing below. The entire structure resembles a small pipe. Greasewood flowers from mid-spring through the summer. On each plant, the male flowers mature and dry up several weeks before the female flower forms. This ensures cross-fertilization of the flowers, not self-pollination. 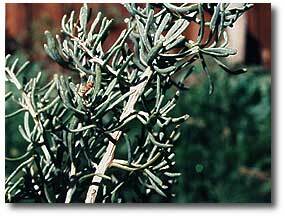 Greasewood plants grow in alkaline or saline soils. Often, sodium or potassium salts accumulate beneath the plant. Greasewood grows in association with other alkaline plants such as shadscale (Atriplex sp. ), saltbush (Atriplex sp. ), halogeton (Halogeton glomeratus) and salt grass (Disticalis spicata). Man used the tough wood for firewood or for toolsif a straight enough stem could be found. The Hopi made planting sticks from straight stems. Native Americans ate the seeds and succulent leaves. Like many members of the Goosefoot Family  spinach kale, swiss chard  greasewood plants have a somewhat salty flavor. 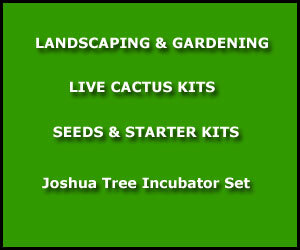 Livestock utilize greasewood for winter and early spring browse. Some wildlife species, such as jackrabbits, pronghorns or prairie dogs, forage on the plant. The plant provides burrowing or resting sites for small mammals or birds. Sometimes kit foxes plug up escape holes of rodents that have burrowed below the greasewood plant, then proceed to dig out the rodent. Greasewood seeds germinate only in cool temperatures. This insures that the seeds get established before the heat of summer. 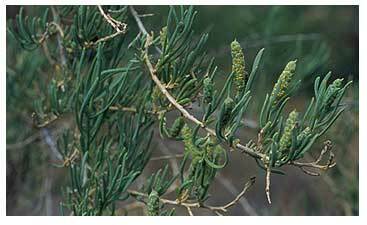 If greasewood grows in very alkaline soils high in chloride salts, its leaves are smaller and thicker in size. Greasewood may have long root systems that can reach down over 50 feet to ground water.